Note that since this piece was published, Damian Martin is no longer at Ara. This is a story of vision, belief and single-mindedness. It is a story of exploration, engineering and overcoming adversity. It is the story of a project that many said could never succeed, and which still requires a deep well of faith to sustain it. Finally it is a story of a search: a search for the essence of a wine, and the soul of a region. The landscape of New Zealand’s South Island is extraordinary, the result of geological forces that pushed two tectonic plates together, creating creases of jagged mountains like a crumpled piece of paper. Life and agriculture is crammed into the fingers of flat valley floor between.The expansion of viticulture in Marlborough over the past 30 years has been so explosive that the prime flatlands have long since been filled. And so the envelope has been pushing outward, with vineyards creeping closer to the sea and higher up the hillsides. This has meant moving into areas that – this far south – are on the margins of climatic sustainability. Fresh snow fell on my visit in November – the southern hemisphere’s Spring. 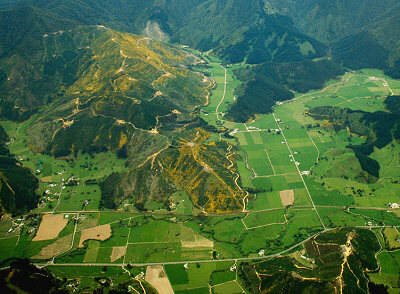 One large piece of land lay undeveloped – a single terrace, nine kilometres long and two kilometres wide, that was one of the most unusual in Marlborough. The Ara terrace (above, seen from the air) lies at the confluence of the Wairau and Waihopai rivers, a 1600-hectare site that uniquely consists of deep shingle overlaid with finer alluvial and loess material. The soils are considerably older that most of the surrounding soils. Though apparently a prime spot for vineyard development, there was a seemingly insurmountable problem with the Ara terrace: frost. The likelihood of frosts severe enough to damage – or destroy – a vintage was almost guaranteed in this cold valley. I imagine many winemakers and developers had viewed the terrace with some excitement, only to face up to the harsh reality that winegrowing in Ara – no matter how unique and filled with intriguing possibility – would be a formidable, ongoing struggle. 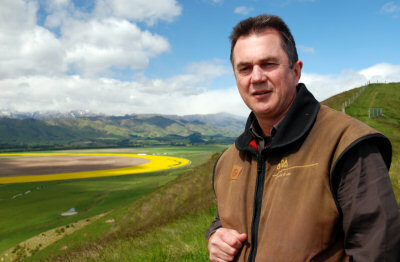 Damian Martin first saw the Ara site in 1999 whilst working for the Corbans winery. He immediately saw both its potential and its problems, and suggested to Corbans they should buy it for viticulture. Damian’s idea was rejected, but Ara, and a very clear vision of what it could be, stayed with him. When he was approached by the land’s owner in 2001, who had heard of his interest, Damian took the plunge and began what must be one of the world’s most ambitious viticultural projects. Born in New Zealand, Damian graduated with a Bachelor of Science degree in chemistry before moving to France in 1987 to pursue a rugby playing career. A burgeoning interest in wine was sparked into life by a bottle of Graves (“a perfectly ordinary bottle – nothing special” says Damian), he undertook postgraduate studies in wine sciences at the University of Bordeaux, culminating in a Doctorate in Oenology and Viticultural Science. His research was focused on the eco-physiology of the grapevine. Damian returned to New Zealand with his French wife in the late 1990s, deciding it was the place for them to bring up a family. He began working for Corbans in 1998, and moved to Montana in 2001, shortly before the Ara project was to dramatically take over his life. If and when the frost problems of the site could be overcome, the Ara project could have so easily been set up as a simple ‘grape factory’ supplying another 1600-hectares of decent quality Sauvignon Blanc to a world market with a seemingly insatiable thirst for the typical Marlborough package of green aromatics, sweet tropical fruit and a huge punch of acidity. But spending a day in Damian’s company – and tasting the wines – reveals that he has a much loftier and more challenging ambition for Ara. Taste through Ara’s three tiers of wine and it is immediately obvious that they march to a very different beat, especially in the upper two tiers – the ‘Composite’ and ‘Resolute’ labels. Damian Martin is a deeply thoughtful and single-minded guy, and though it is a word he rarely uses, it is the terroir of Ara that fascinates him, and finding a way to express that terroir in his wines that will make them so distinctively different from much of Marlborough’s produce. Clearly his experience and training in Bordeaux influences his thinking. In France, the notion of terroir may be dominant in the great wines, but it is also subjugated by the strict codes of the appellation côntrollée system that determine so much of what the grape grower can do. New Zealand, on the other hand, is the land of the free: there are no restrictions on what grapes can be planted, what levels they can be cropped at, how widely the vines can be spaced and so on. Curiously however, this freedom to plant what and how you want on any patch of dirt has not led to an even greater focus on terroir. In Marlborough there has been a recent history of planting simply to make more and more of a somewhat generic style of Sauvignon Blanc. Damian’s ultimate ambition is to fuse the best of the New World and the Old in wines that will be 100% ‘Ara’, which he hopes one day will be an appellation all of its own. “Marlborough’s climate is unique, with great UV light levels giving terrific photosynthesis and plenty of discretionary sugar,” he tells me. “There is no degradation of this by heat as it is also so cold and fresh. This doesn’t override the other variables of clonal selection, planting, yields, bud numbers, yeasts, winemaking, etc., but it is certainly half the picture.” What this means, according to Damian, is that the creation of a unique wine style is possible. One of the most impressive aspects of Ara is not the meticulous vineyards or stunning natural setting, but a colossal piece of dramatically no-nonsense engineering. The pump house is a building at the heart of Ara that houses six massive diesel engines that can each pump 600 litres of water per second. This is not a high tech, discreet facility, but a hissing, fizzing boiler room of iron, brass and pressure gauges. The pump house is fed from ‘Lake Pinot’, a man-made lake that draws from both the Wairau and Waihopai, and feeds in turn to the secret of what makes Ara tick: a system of 40,000 sprinklers (below). The sprinklers are the secret weapon in the fight against frost. An elaborate system of temperature sensors throughout the vineyards constantly feeds data back to the control centre. For the 10 weeks or so when there is a risk of frost, a rota of vineyard personnel (and Ara has a large permanent workforce) is automatically alerted when a frost is imminent. At any time of day or night they will head to the pump station and crank up the right power to feed enough water where it is needed. The mechanics are simple: as the temperature drops, the water droplets freeze on the vines. When water freezes, it gives off latent heat. As long as ice is continuously forming around the plant, the plant will be protected. Ara is by no means alone in trying to define something new about Marlborough wines. There is a strong movement to show that Marlborough is not a ‘one trick pony’ with its Sauvignons, with an increasing number of variations on the theme: oak-aged, wild-fermented, blended with Semillon. But Damian Martin eschews most of these, determined to make an expression of pure Sauvignon Blanc. “Natural yeast ferments are interesting, but we have to keep it clean – if we are all about our vineyards, we can’t have ‘dirty’ winemaking.” He is experimenting by fermenting his top Sauvignon in small, steel barrels with lees stirring, but my suggestion that the Resolute might benefit from some Semillon or oak for mid-palate texture was met with short shrift. 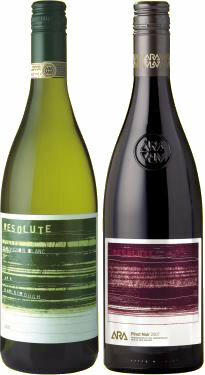 There’s a steeliness about Damian Martin’s determination to make Ara’s wines as a singular, natural expression of site. There’s an almost aesthetic focus on style that seems to pay little heed to fashion, peer group influence or even commercial pressure.Though the introductory tier, ‘Pathway’, is more immediately ‘Marlborough’ in style – with a fairly flamboyant Sauvignon and fruity, juicy Pinot – these are not ‘easy’ wines. The upper tiers are fairly uncompromising: an interpretation of Marlborough that some will complain lacks the fireworks they are expecting, but which carries with it layers of concentrated, savoury, subtle complexity that mark these wines powerfully. Ara is a very, very young project. It’s first commercial wines were released only in 2005, and its most mature vineyard are only seven years old. If the Ara team’s theories on their planting densities, irrigation controls and winemaking prove right, and as the vines age, these wines – already full of interest and intrigue – could be destined to become some of the world’s greatest expressions of grape and place. Similar winemaking to the Composite, but a barrel selection of the best barrels from the best parcels, kept in barrel for a couple of months more. Again that earthy, mineral family trait is here. The nutty, creamy oak sits beneath a touch of leafy, brackeny character and the ripe, strawberry fruit is there in between the layers. The palate has very good concentration: the sweetness of the fruit is there, but swept up in leafy, cedar and dry extract character. 93/100. £19.99, Majestic. There’s a more plummy, deeper fruit quality here, but it is soft and brackeny too, with strawberry pulp and a touch of redcurrant. On the palate this has really good, vegetal Pinot character, with good concentration, but retaining that light and elegance, and the dryness of the acidity. Drinking really nicely, this has tight tannins and a finesse, in a subtle balanced finish with a bit of spice. 91/100. See all Winegrowers of Ara stockists on wine-searcher.